Share all your important documents easily! Share documents, files, links and resources in one place! Share all your important documents, links and resources easily! Share your important production documents and links with your team in one place. Most productions uses pdfs, Excel templates or Word documents for screenplays, AV scripts, call sheets and team lists. All that is already included in Dramatify through our basic functionality that formats everything perfectly for the device you are using, regardless if the screen is huge or tiny. However, there might be a lot of other documents you want to share for your TV, film, video, commercial or VR/360 production. It can be anything from templates and policies to production schedules, bookings and so on. 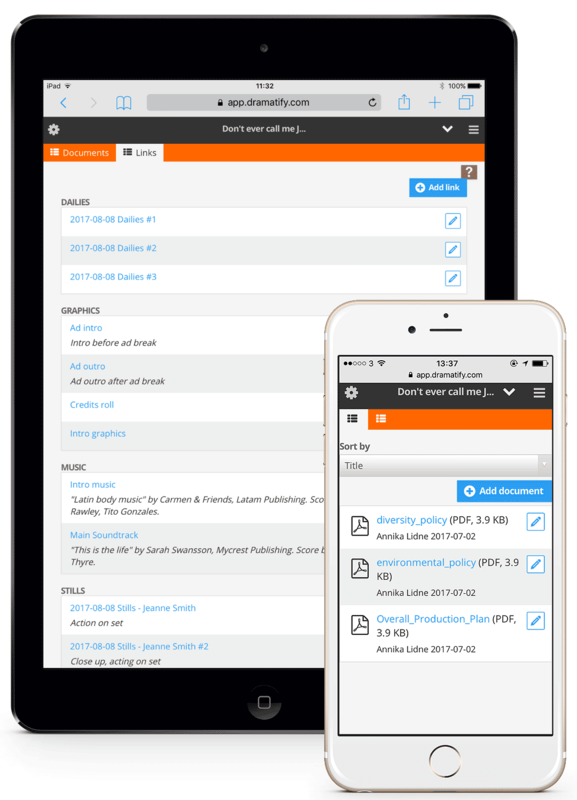 In Dramatify you can upload a variety of different file formats; pdf, .doc, .docx, .xls, .xlsx and .zip and the maximum upload size is 4MB. You can also share links to content with your team, from web pages to resource links to large audio, video and graphics files. This makes it easy to collect everything from theme music to intro graphics and dailies in one place without having to wait for big uploads. Compared to other solutions like Dropbox, there is also less risk that team members accidentally delete files as they are at all times well aware that the file is on Dramatify, and not in a folder on the computer. To delete a file, you consciously have to choose that alternative. Also, the file on Dramatify is always an uploaded copy, so the original is safe on your computer.